Dr Cysique’s NeuroHIV group at Neuroscience research Australia (NeuRA) and UNSW have identified that there is a high mental health burden in people living with HIV infection (PLHIV) in Australia (i.e., the life time prevalence of anxio-depressive difficulties is 40% in HIV+ BGM and the last 2-years prevalence is 20%, Cysique at l., 2016 https://www.ncbi.nlm.nih.gov/pubmed/26304840). Moreover, an increasing proportion of this HIV population has reached their 60’s because of the success of combined antiretroviral treatment (cART), which sees those infected live almost as long as the general population. However, the ageing HIV population lives with a greater comorbidity burden than people of the same age, and their ageing syndromes are accelerated. 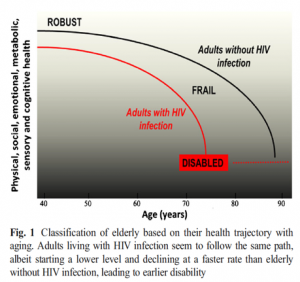 from Thurn M, Gustafson DR. Faces of Frailty in Ageing with HIV Infection. Commenting on our ageing HIV population, Dr Lucette Cysique from NeuRA says,” the impact of a high mental health burden, chronic HIV, and ageing including cognitive ageing, is not known and demands further resource allocations, both clinically, and research-wise, to plan ahead and inform policy makers as well as determine optimal management and treatment plans”. “In Australia, there is limited current data regarding the mental health burden in HIV+ persons who are beyond the age of 50. There is more data on the burden of cognitive deficit related to ageing and HIV. Based on my recent research (https://www.ncbi.nlm.nih.gov/pubmed/28264037), however, cognitive health cannot be considered without paying attention to mental health. This is because, psychiatric burden is associated with worsening of all health indicators in people with chronic disease including dementia and mortality”. “Current mental health care is not adapted to the elderly HIV population, and elderly care is not adapted to PLHIV with mental health problems in Australia. It is very important that PLHIV receive mental health care in an environment that is not stimagtising as Australian social science research in PLHIV has shown that stigma is a factor for poor mental health (https://www.ncbi.nlm.nih.gov/pubmed/26874848). In fact, the current mental health service at St. Vincent’s Hospital, which catered to PLHIV called “H2M” has unfortunately been cut (http://www.smh.com.au/national/health/st-vincents-hospital-calls-in-external-consultants-to-staunch-18-million-blowout-after-touting-on-budget-performance-20171123-gzrqdd.html) without any consultation of the staff. Yet after I consulted this service for a research project, it was identified that urgent resources were needed for the mental health care of ageing PLHIV.” Said Dr Cysique. At NeuRA, Dr Cysique is developing a project with a cross-disciplinary team of psychiatrists, psychologists, neuropsychologists, neurologists, neuroscientists and social scientists in Australia and internationally to develop research into HIV and ageing and mental health. The aims of this research project are to inform on best clinical practices and treatment/interventions to support healthy ageing in PLWHIV.